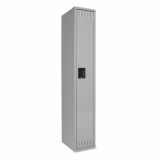 Tennsco Single Tier Locker, 12w x 18d x 72h, Medium Gray - Durable single-tier locker is made of heavy-gauge steel with tamperproof hinges. Compartment measures 12 wide x 18" deep x 72" high. Three-point locking mechanism provides complete security. Number plates are included for locker identification. Vertical louvers provide ventilation. Door to the locker has a padlock hasp. Locker does not include a padlock. Full-length door stiffeners add rigidity and deaden sound when opening and closing. 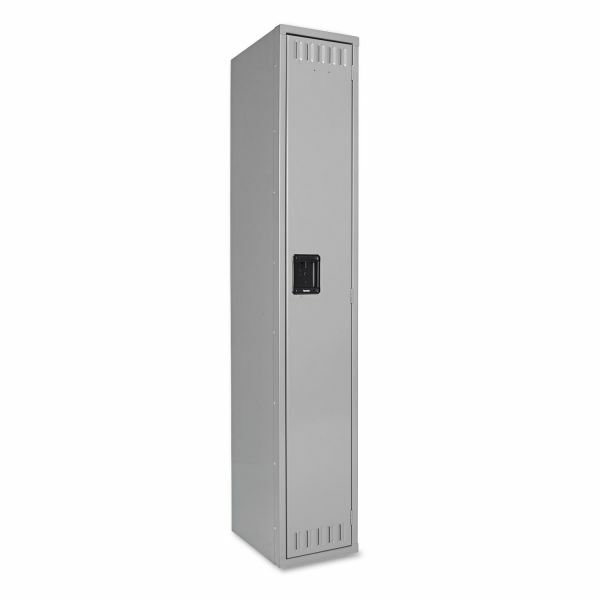 Single-tier locker also features a recessed black metal handle, hat shelf and coat rod. Multiple rows of lockers can be ganged with standard nuts and bolts (not included)."